Book Trailers: Do They Work? 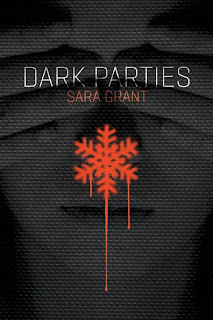 A couple of weeks ago I was lucky enough to attend a webinar interview with debut author Sara Grant, author of a new dystopian YA novel called Dark Parties. About the Book: In a world shrouded in fear and lies, how can you shed light on the truth? Sixteen-year-old Neva lives in Homeland, an isolated country separated from the rest of the world by the Protectosphere. The government insists there’s nothing beyond its borders, but as Homeland’s resources dwindle, people, girls mainly, have started to go missing. If there’s no way out of the Protectosphere, where are they going? Suspecting the government is lying about everything, Neva and her friends stage a Dark Party in the hope of uncovering the truth and finding the freedom they dream about. So of course, with all that I was intrigued and I couldn't wait to chat with Sara! Since the book starts with a Dark Party (i.e. a party held completely in the dark with the attendees relying on other senses) I had to ask if Sara had ever experienced a Dark Party herself. In the first scene I was reminded of reading a news article about Dark dining-which to me, sounded very scary! Lucky for us, Sara was brave enough to try it! 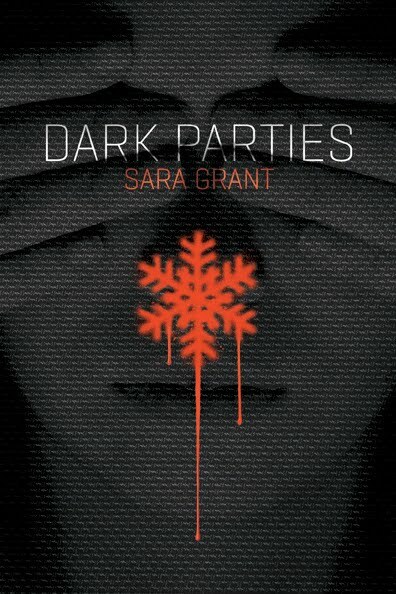 Sara Grant: When I got the book deal and I was involved in the revision process for Dark Parties, my friends had a party for me at a restaurant in London (where Sara lives) called Dans Le Noir. And we all met and had dinner in the dark, and it was absolutely fascinating. And actually there were a lot of things in the book that I added because of that experience. I live in a city where you're rarely in the pitch black. You're rarely in that type of deep darkness when it almost feels like the darkness is closing in on you and you have no orientation. As we walked in the restaurant, you had to put your hand on the person’s shoulder in front of you as they led you to the table. And all the waiters and waitresses were blind. At one point, the person in front of me stopped because she had lost contact with the person in front of her. And we're standing there in the middle of pitch black, knowing that we had no idea where to go or how to get back out of this room. Also, the experience of talking to other people changes, because you realize how much conversation goes on with sight. As you're talking to someone, you're looking in their eyes to see if they're listening, you're looking at their body language and you either wrap up a story or you respond to a story using eye contact and all those kind of things. GreenBeanTeenQueen: I've never thought about that before, but you're right. I think it would be really hard not to look at someone and make eye contact. You wouldn't know if they were actually listening or cared! I found that the dinner was cut very, very short. And I was with a normally ver talkative group of people, but the conversation was really stilted because we couldn't see each other. The other thing they did--and this is completely unrelated but fun -- is that they wouldn't tell you what you were having. You had to pick - meat, fish, vegetarian or chef's choice. I went with chef's choice. Sara Grant: At the end, they take you upstairs to this lit room and they ask you what you had. And they laughed at me heartily because I guessed something like beef teriyaki, and it was actually alligator and some other kind of bizarre thing that, if I'd have known, I probably never would have eaten. But it was really interesting. I highly recommend it. I'm not sure I'm going to rush out and do it again very soon, but I highly recommend it. GreenBeanTeenQueen: Sounds cool-a bit scary, but cool! I also asked Sara about her thoughts on dystopian worlds and if she thinks some of the stuff in fiction has a possiblity of coming true. Sara Grant: Where I live in London, we have CCTV, which is Closed Circuit Television. And on one hand, it's fantastic because it keeps you safe and people are watching out for you. But, at the same time, people are always watching. And if you watch the news sometimes when they're tracking a criminal, how they piece together a person's movements, it feels like there are very few places in the citywhere you're not being watched. Also, I'm a big fan of CSI and any kind of crime drama. A lot of the technology is there to track. If I check in on Facebook, people can track where I am and what I'm doing already. And people are watching me. So, in that sense, I think we're not too far from that. I hope we're a very, very long way from ever closing ourselves off and not taking advantage of all the diversity that's out there, all the different cultures and different ideas and different philosophies. I hope that never happens in a big or small way at all. Want a chance to read Dark Parties? Check out this sneak peak and then enter for your chance to win a signed copy! I'm with you, I don't think I could have done the chef's choice either. When I go somewhere and am not familiar with the food I usually pick vegetarian, not because I am one, but vegetables are usually a safe selection. Great post! Thanks for sharing! I am probably the pickiest eater ever. I have the strongest gag reflex too. Thanks for the giveaway and the interesting interview!